Indeed, it is both fun and informative! It’s always easier to see problems in your design when it is displayed in graphs. You should check out those two projects I mentioned at the beginning of the post. I’m not sure if the are the same… or if one is the fork of another…. or if they are completely different, but I remember I used django-graphviz and it was excellent, it worked really well! It will be perfect for my project. Glad to hear my humble two year old post is still useful :). Federico! Fancy seeing you here! Welcome to my humble (and not so updated) blog! Hi Raj, I made an app with wxpython and pydot that “drew” graphs in realtime according to a grid that the user can use to model the graph (http://code.google.com/p/pyflowuca/). Unfortunately the source code is in spanish, but let me tell you how I did it. I just created the graphs on a temporary file using python’s tempfile module and loaded the file using wxPython bitmap loading functions. Just remember to delete the file once you’re done. Cool, looking at directive graphs in Python right now, the python-graph looks good but couldnt get it working with the brief amount of time spent today. This pydot seems to work out of the box, sweet. Did you ever get this runing with py2exe?? Hi Alan, pydot is indeed very simple to get working and use. I don’t remember having to do anything special to make pydot work with py2exe, did you get it working? any pointers for pydot+boost to work in python? I’m glad this was useful for you! Unfortunately I have no experience on boost, sorry I can’t help you on that. 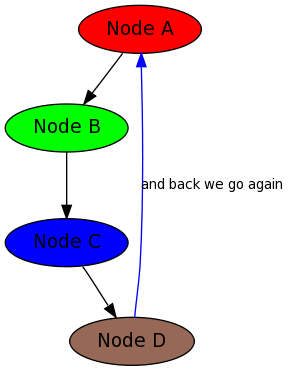 I can build to .exe but it still requires the Graphviz.exe. All the libs I have seen (pydot, pygraphviz) all need Graphviz installed on the computer. The issue I am having is directing Pydot or PyGraphviz to the relevant DLL’s which Py2exe pulls out correctly. For example when I use PyGraphviz it references the Graphviz exe’s through an import _graphviz (which is .pyd file that calls the Graphviz .exe’s). Still digging… in essence I would of thought that there was simple Pyhon libs to go from .dot to .svg without this Graphviz?? Also seen WinGraphviz.dll which I think is independant of Graphviz, just need to figure out how to use it. Thank you so much, this was really straight to the point. I wonder why pydot has such a poor documentation. Thank you very much. This got me up and running with pydot in about 10 min. The one thing I didn’t do was have GraphViz installed before trying to run the code. After installing GraphViz it on Win 7 x64, it was smooth sailing. is there any way to use pyDot to create a tree and then build a GUI application in wx using the nodes in the tree as widgets? Excellent tutorial. Just what I needed. The dpaste links to source code no longer work. Perhaps make github gists of them? These examples were built with Python 2 in mind, and you seem to be using Python 3, so I am afraid I cannot assist you debugging this issue. The error tells me this might be an issue with data types… I hope you got it fixed. Federico, firstly thank you for the great source. Couldn’t import dot_parser, loading of dot files will not be possible. Would you have any hint to fix it? Hi Ricardo, I’m glad this humble post is useful! This is the clearest explanation of use of the graphviz and pydot libraries that I have found to date. Kudos to the clarity and simplicity of your explanation. Big help with helping me diagram the system architecture of a web project for a recent Python Programmmig course that I’m enrolled. Well done! I’m not sure what this comment refers to. This is a very useful post about how to use pydot to visualize graphical models. Pydot is a python interface for Graphviz. I don’t know which version of Windows you’re running, but first I would suggest that you make sure that you have installed Graphviz and pydot. Why is pydot unable to find GraphViz’s executables in Windows 8? It seems that you either need to install them in a specific order (first Graphviz and then pydot) or add Graphviz binaries directory manually to your PATH, check the answers in that post and see what works for you. Let us know what worked and, if you can, +1 the answer that worked for you so that others can also benefit. Fantastic post! This will be a nice addition to the Cisco ‘cdp’ script I’ve written. Exception: “dot” not found in path. Hey Omkar, seems like Python cannot find dot. Pydot is an interface for the program that does the drawing, dot, which is part of Graphviz. Depending on how you installed pydot, Graphviz might have not been installed. can you try installing Graphviz and checking if this works? If you have already installed Graphviz, you can take a look at this post in Stackoverflow, it lists several solutions for this problem for both Windows and Mac: Why is pydot unable to find GraphViz’s executables in Windows 8?